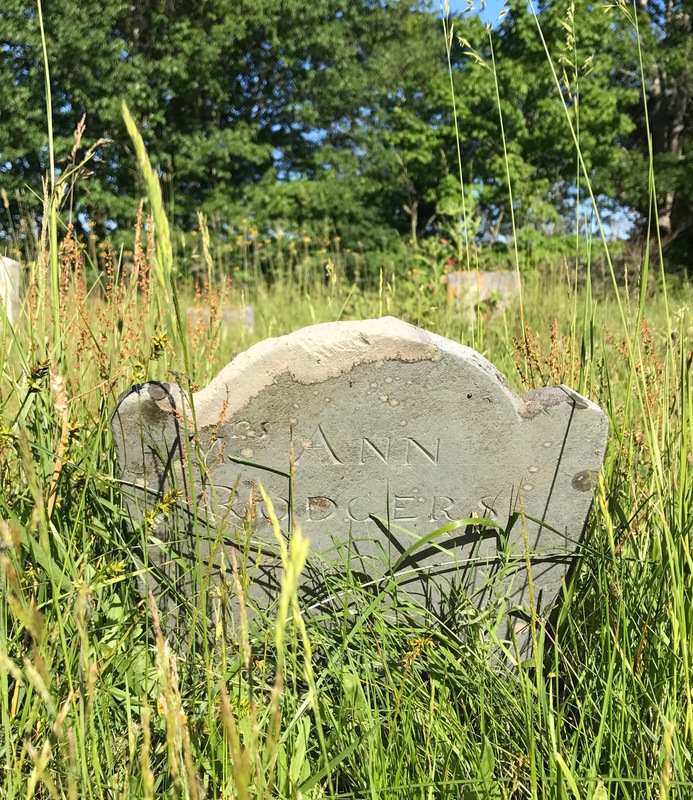 Last week, I finished up my series on Portland, Maine’s Eastern Cemetery. That one was hard to say goodbye to! The next day we traveled up to Bath to visit the Maine Maritime Museum, then moved on to the Pemaquid Point Lighthouse. I love lighthouses of all shapes and sizes, and this one is top notch because you can actually go up into it. Not all of them are in such good shape or have full public access. My husband, son and I also spent a good bit of time climbing all over the rocks above the crashing waves. The original lighthouse was commissioned in 1827 by President John Quincy Adams and built that year. Due to poor construction, it was rebuilt in 1835. The keeper’s house was added later. However, I knew I had a good chance of stopping by another cemetery on our way back up the Pemaquid peninsula. 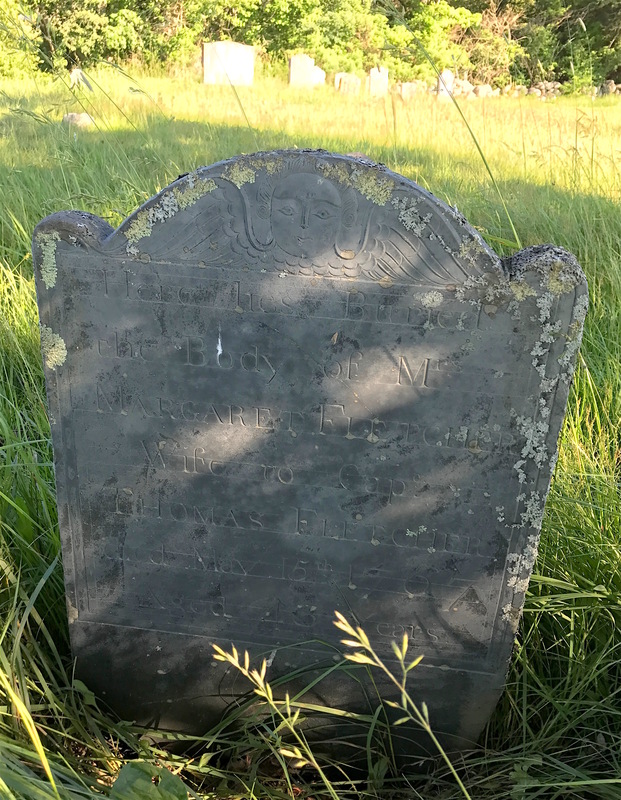 I persuaded my husband to drive over to Colonial Pemaquid so I could get a good look at the Old Burying Ground (that’s what they call it). We were hopeful we could find a place to grab dinner afterward. Located in New Harbor near Bristol, the Colonial Pemaquid State Historic Site includes the reconstructed Fort William Henry, along with archaeological remains of 17th- and 18th-century village buildings and fortifications. 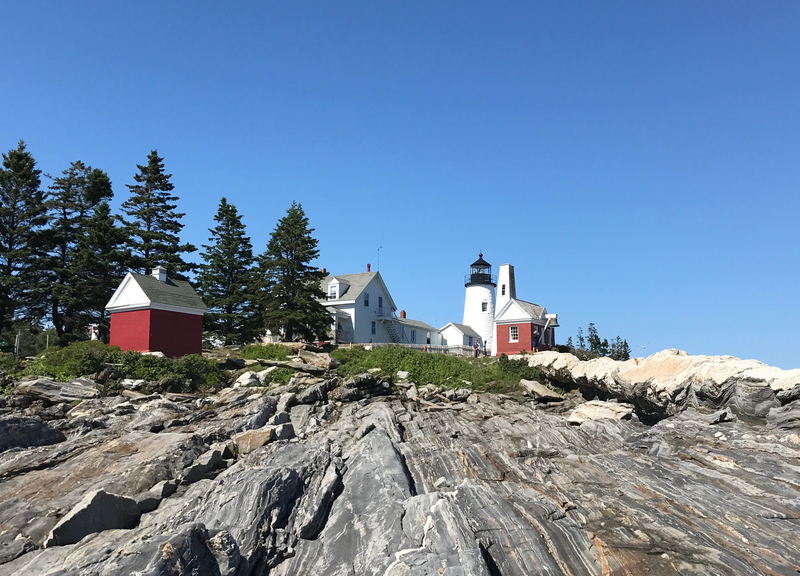 Pemaquid was a colonial settlement dating to the early decades of the 17th century, with a succession of conflicts leading the site to be attacked on several occasions and entirely abandoned twice. 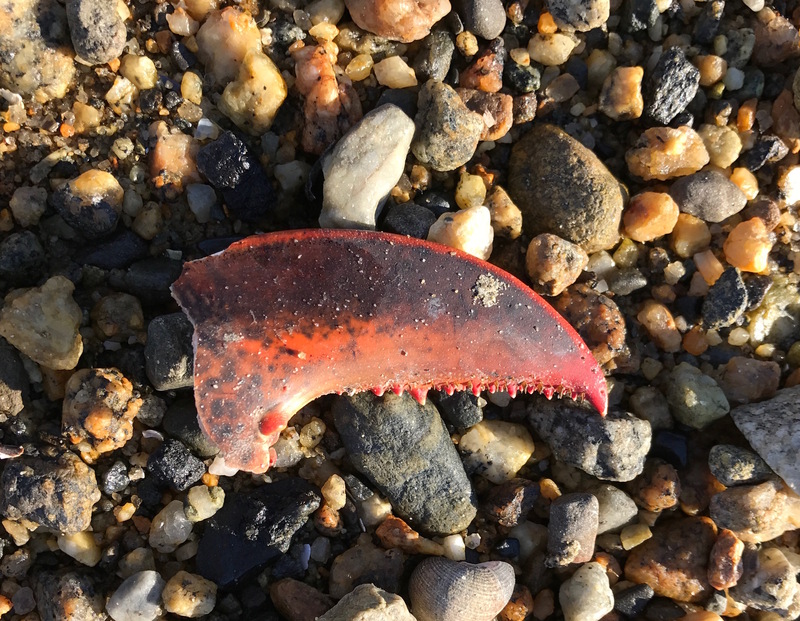 The area was used by English and French traders and fishermen on a seasonal basis for some time, and the first documented permanent residence was established in 1628. Colonial Pemaquid has a museum with artifacts found on the site including musket balls, coins, and pottery. But it was closed by the time we got there. 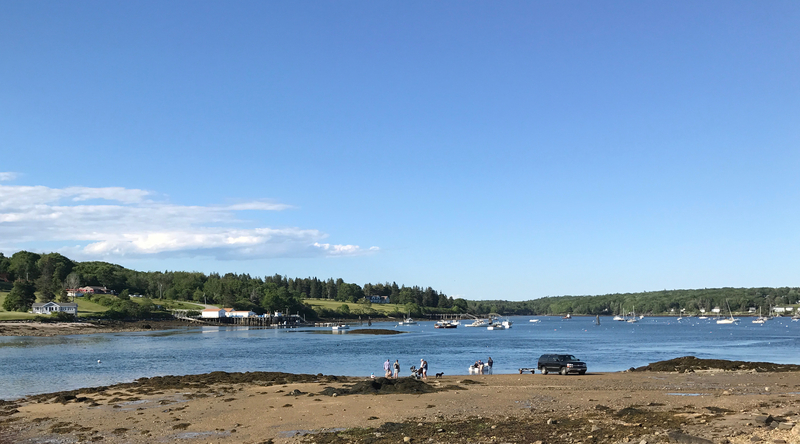 My husband and son were eager to explore Pemaquid Beach next door and we spotted a seafood restaurant where we could dine later. I headed over to the Old Burying Ground. The tide was going out when we got to Pemaquid Beach. 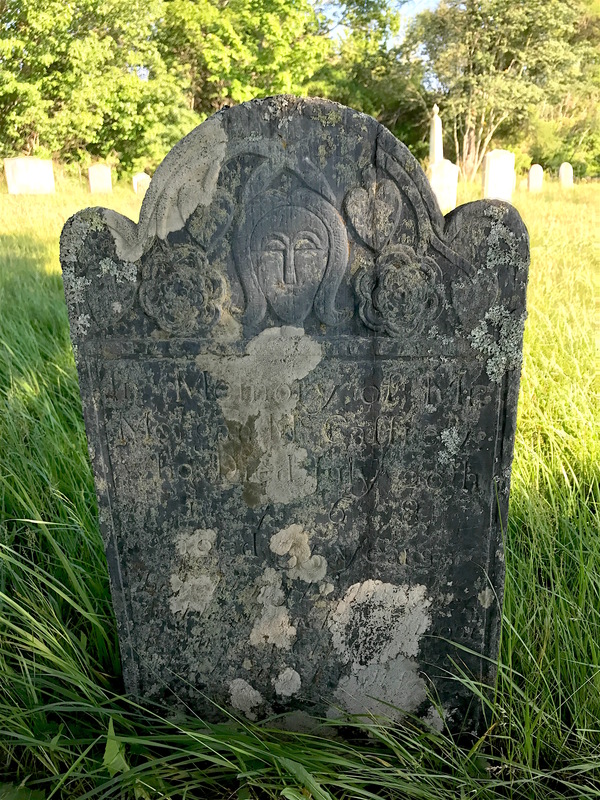 With a view of Pemaquid Beach, the Old Burying Ground is a lovely place to explore. At the time we were there, the grass had been cut in some areas but not in others so getting great pictures of some of the markers wasn’t easy. But it was still amazing. As it often does, being in such an old cemetery makes me feel like I’m going back to another time and place. 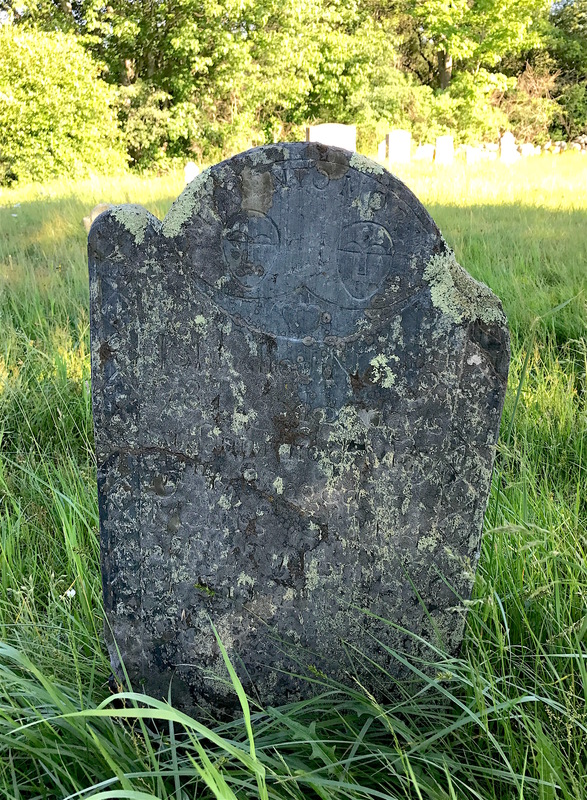 A very helpful sign explained that while the oldest dated cemetery marker comes from 1734, stones from as far back as 1652 have been found in earlier times. Unmarked field stones are plentiful. There’s also a mention of Indian attacks in the village during the 1600s that required mass burials. Currently, there are 200 names recorded of people buried at the Old Burial Ground but there are many, many more that remain anonymous. The Old Burying Ground has a variety of marker styles represented, from skulls to willow-shaded urns to modern recent ones. The familiar flying skull is on the slate marker of Ann Rodgers, who died at the age of 41. She even has her name on the back, too. The familiar winged skull adorns Ann Rodgers’ marker. I’m not sure why Ann’s name is on the back of her marker. 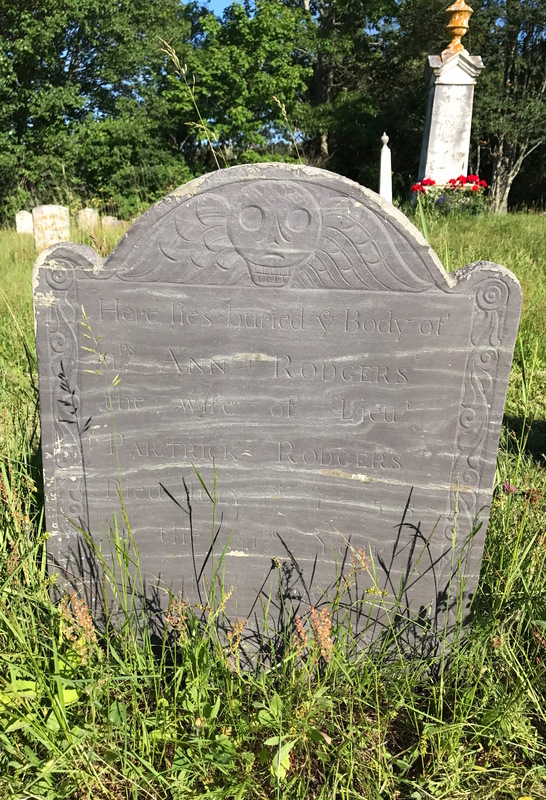 There was also a winged face marker (called a “soul effigy”) represented by the stone of Margaret Fletcher, who was married to a sea captain. Margaret Fletcher was married to a sea captain. The sign also noted that like Eastern Cemetery, the Old Burying Ground includes stones from a reputable stonecutter. His name was Joseph Sikes, and he came from a family of stone cutters. Because his work is so similar to that of his son Elijah’s, it is often hard to tell who did what stone. Sometimes Elijah marked his stones with an “E.S.” at the bottom. While not born in Maine, Joseph probably moved from Massachusetts to the coast of Maine. His work spanned the 1770s to about 1800. It can be found in cemeteries in Connecticut, Massachusetts, Vermont, and Maine. The Sikes style is almost folk art-esque, giving it a primitive charm. They favored oval-shaped heads, semi-circle eyes, flowers, grapes, vines, moons, hearts, and the words “momento mori” (Latin for “remember death”). The marker for Morgan McCaffrey is not in good condition due to the poor quality of the stone. The elements have also taken their toll. Fortunately, I was able to find out a little about him. The marker for Morgan McCaffrey is in poor condition due to the elements, but its folk art motifs are still charming. According to his Find a Grave memorial, Morgan was married to Anna Little, the daughter of James Little. Her father was killed by Indians at Fort Frederick on Sept. 2, 1747, according to the Massachusetts Archives. James Little was granted land in 1736 from Great Britain under the Waldo Patent. This was a document granting title to 36 square miles of land in Maine. It’s named after businessman Samuel Waldo, who eventually gained control of the patent. It was previously known as the Muscongus Patent because one of the boundaries was a river by that name. After James’ death, Anna and her sister Sarah (along with their husbands) inherited and sold this land. Morgan died in 1768 at the age of 35. His daughter, Jennie, is said to have written his epitaph. Jennie had also been recently devastated by the loss of a brother, who drowned in a well near their home. That he and I will save. Thomas and Esther Holden share a marker done by Joseph or Elijah, the long oval faces at the top being a trademark. Had it not been for Find a Grave and a book, I wouldn’t have known their names because the stone is in very poor condition and spotted with lichen. 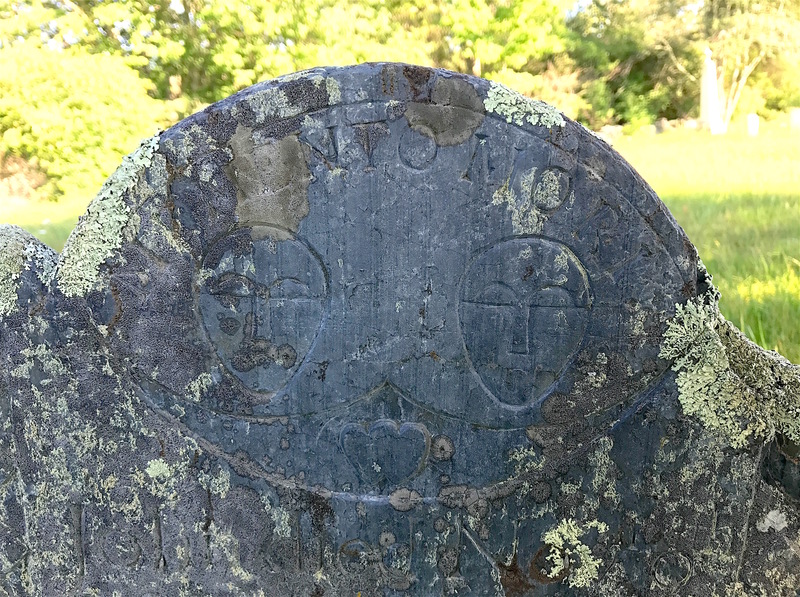 Thomas and Esther Holden died within a year of each other and share the same marker. Fortunately, you can still see the faces and the words “momento mori” at the top. It looks like Thomas’ face may feature a mustache. You can also faintly see what looks like two hearts merged into one below the faces. “Momento Mori” (translated to mean “Remember Death”) was frequently carved on markers from the 18th century. Thomas died at the age of 75 on May 19, 1784 while Elizabeth died at the age of 64 on Feb. 6, 1785. 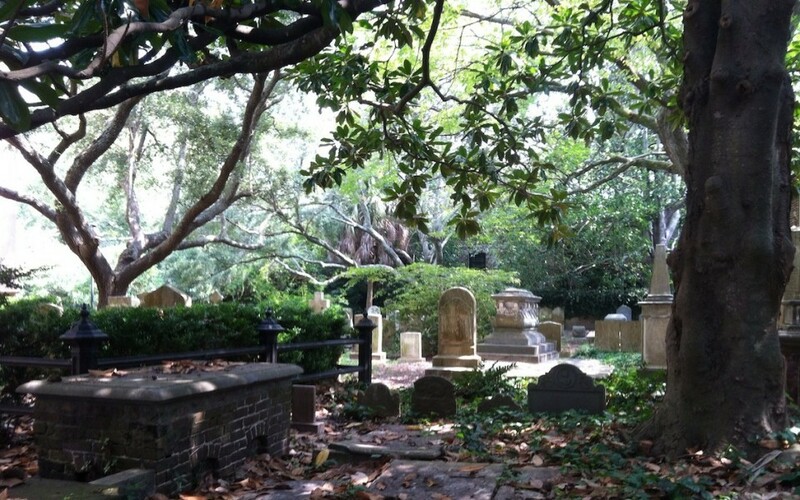 It’s believed that Joseph Sikes died sometime around 1801. While he spent his life in the Maine/Massachusetts area, Elijah moved to Vermont then went west. He’s buried with his wife, Lucretia, in Brookfield, Ohio. His own marker is quite plain compared to those he carved. I’ll be back soon with more stories from the Old Burying Ground at Pemaquid. In the meantime, with Christmas only a few days away, I hope you have a happy holiday season! Beautiful pictures and interesting background info on the sone carvers. Love the 2 hearts as one…never seen that.